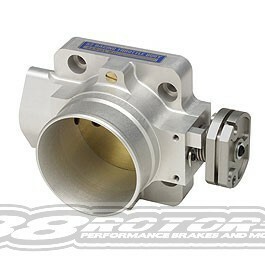 The Skunk2 Racing Pro-Series Billet Throttle Body increases horsepower and torque by optimizing airflow to your engine. On forced induction applications, this quick bolt-on has shown gains of 50+HP. On high-output naturally aspirated engines, we have seen gains of 10+ hp. Our larger bore throttle bodies are capable of flowing enough air to support over 1000 hp. Skunk2 Pro-Series throttle bodies are precision CNC-machined from forged AL6061-T6 billet aluminum, vacuum tested, and hard anodized for increased durability. With greater reliability and smoother operation, Skunk2 throttle bodies exceed industry standards. We’ve eliminated the factory water lines for cooler operation and each throttle body features a serialized Skunk2 nameplate to ensure authenticity.